Objectifs: Les objectifs de cette étude étaient d'étudier la relation entre les composantes de profil lipidique chez les groupes de différents corps (IMC) Indice de masse et étudier l'association entre le sexe et l'IMC. Méthodologie: Cette étude transversale comprenait 218 enfants et des adolescents ; 104 hommes et 114 femmes. Tranche d'âge accepté était de 2 à 18 ans. Données ont été recueillies entre février et mai, au cours de l'année 2017 et ont été analysées en utilisant le logiciel de statistiques pour les Sciences sociales. Écart-type (SD) pour IMC a été calculé selon les directives de l'Organisation mondiale de la santé. Par des rapports de laboratoire, les résultats du profil lipidique ont été examinées. Résultats: Près 10,6 % de la population étudiée s'est avéré pour être une surcharge pondérale ; un autre 22,1 % souffraient de l'obésité, dont 7,1 % étaient obèses morbides. Les enfants qui avaient des niveaux élevés de lipoprotéines de basse densité (LDL) et de faibles niveaux de lipoprotéines de haute densité (HDL) ont été trouvés parmi les groupes IMC élevé, avec des niveaux élevés de cholestérol a noté chez les patients de l'augmentation du poids. Une augmentation des niveaux de HDL a été notée dans 71 % des enfants qui ont évité la consommation fast food. Prédisposition significative entre les sexes à l'évolution de l'IMC n'a pas été trouvée (P = 0,467). Conclusion: IMC élevé s'est avéré pour être associés à l'augmentation des niveaux de cholestérol LDL et une diminution des taux de cholestérol HDL. Aucune association significative entre le sexe et les changements dans le profil lipidique a été créée (P = 0,898). Recommandation: Tous les pédiatres doivent garder un oeil ouvert sur les enfants en surpoids et obèses, systématiquement leurs mesures de poids et de dépistage de la dyslipidémie en obtenant un bilan lipidique complet pour tous les enfants dont le poids sont 2 SDD au-dessus de la moyenne. The World Health Organization (WHO) regards obesity as the accumulation of excess fat that poses a direct risk to health. In terms of body mass index (BMI), which is a crude population measure for obesity, obesity includes values 2 standard deviations (SDs) above the mean weight for age and gender, while overweight covers values between 1 and 2 SDs above the mean. Results from comprehensive studies are now causing great concern as they are showing a global increase in the rates of overweight children worldwide, including Saudi Arabia.,,, The Middle-East is contributing to the global epidemic of obesity with prevalence rates of obesity and overweight in Saudi being 9.3% and 23.1%, respectively, for school-aged children between 5 and 18 years and 6% and 15.7%, respectively, for preschoolchildren aged between 0 and 5 years., It is estimated that by the year 2020, three quarters of all deaths would be attributable to noncommunicable diseases, of which obesity is a major risk factor. Several studies have confirmed the link between dyslipidemia in the setting of obesity and high BMI.,, Cardiovascular diseases (CVDs) are an example of the most predominant noncommunicable diseases, widely known as the number one cause of mortality worldwide. They are associated with both obesity and dyslipidemia.,, The most common dyslipidemias that have been associated with obesity are elevated triglycerides (TGs) and low-density lipoprotein (LDL) and decreased high-density lipoprotein (HDL) levels., As evidence suggests, high serum HDL and LDL levels are associated with longevity and low HDL-cholesterol (HDL-C) level is associated with an increased cardiovascular risk, particularly if serum cholesterol and TGs are also elevated. Among different characteristics that contribute to metabolic syndrome, an abnormal lipoprotein profile plays the basic role, with LDL-cholesterol (LDL-C) values achieving the gold standard parameter for the evaluation of CVD risk. Moreover, while CVDs are rare in childhood, these factors and their predisposition to coronary artery disease (CAD) are seemingly related to the likelihood of childhood obesity persisting into adulthood. Therefore, we address these issues now in an aim to benefit our children prospectively and decrease their cardiovascular risk in the future. Controversy regarding gender predisposition toward higher BMI was raised as a result of some studies claiming an increase in the prevalence of overweight rates among females, rendering them more exposed to the negative health consequences of obesity. However, other studies have argued the opposite, which is that the higher prevalence was reported more frequently among males. As part of our study, we hope to investigate the probability of gender bias toward higher BMI throughout childhood. An institutional ethical approval and patient consent had been obtained prior to the commencement of this study. This study is a descriptive, cross-sectional study that was carried out throughout the year 2017 during the months of February to May. Data were collected from patients attending endocrine outpatient clinics in Jeddah, Saudi Arabia. The sample size encompassed 218 patients; 104 (47.7%) of which were boys and the other 114 (52.3%) were girls. All children between the ages of 2 and 18 years were included, regardless of their gender. Participants' mean age was 9.9 (±2.5) years. To properly assess the correlation of BMI with abnormal lipid profiles, patients with chronic illnesses that may interfere with findings, such as diabetes, or on certain medications known to affect aspects of the lipid profile, were excluded from the study. Those whose BMI SD values were out of range or their height and weight measurements were missing were excluded as well. For patients who were too young to be interviewed, below 8 years of age, their caretakers were approached instead. Questions asked encompassed the child's detailed medical and nutritional history, in addition to their level of activity and demographic background. Laboratory reports were reviewed and lipid profile test results were noted. The reference values used in this study were 0–5.2 mmol/L for total cholesterol, 0–3.57 mmol/L for LDL, 0.9–1.55 mmol/L for HDL, and 0.3–2.3 mmol/L for TGs. Participating individuals or their guardians confirmed a fasting period of 12 h prior to blood withdrawal. The height and weight of all patients were then documented using a single scale rounded up to the highest 0.1 kg for weight and a mechanical beam scale with a height rod rounded up to the nearest centimeter (cm) for height. BMI was further calculated by dividing the value of weight in kilogram by the value of height in square meters. Considering that BMI is a convenient method of screening for obesity and is regarded a suitable alternative for direct measure of body fat, children were classified into four categories. In concordance with the WHO, those with a BMI within 1 SD of their age and gender were considered normal, those between the 1 and 2 SDs belonged to the overweight category, those >2 SDs were assigned to the obese category, while those exceeding 3 SDs were placed into a morbidly obese category. Data were interpreted using the 16th version of the Statistical Package for the Social Sciences (SPSS, SPSS 16, IBM, Armonk, NY, United States of America). Correlation coefficients between BMI and lipid profile components (total cholesterol, LDL, HDL, and TGs) were calculated and then tested for significance. Simple descriptive statistics were reported in proportions for qualitative variables and in mean and SD for quantitative variables (e.g., mean of cholesterol, LDL, HDL, and TG among BMI levels). Variations of lipid profile means among different BMI groups were tested using one-way ANOVA. A linear regression was performed to evaluate the prediction of each component of the lipid profile on log BMI kg/m2. An independent sample t-test was used to test the difference in each of the mean components of the lipid profile among genders. The results were considered statistically significant if P < 0.05. Nearly 10.6% of the population were found to be overweight and 22.1% were obese, of which 7.1% were morbidly obese. Only 67.3% of the population were found to be within the normal range for weight according to their age and gender. These results were associated with changes in lipid profile, with a sole exception of TGs, of which no relationship was established with either obesity or logBMI (P = 0.467). [Table 1] summarizes the relationships between various components of the lipid profile to different values of weight and BMI in terms of direction and strength of association. Regarding gender predisposition, no association between any gender and changes in lipid profile was observed proven (P = 0.898). CAD has been considered the greatest epidemic humankind has ever faced, of which obesity and dyslipidemia are two of the major contributors to its development. More so, leading risk factors such as atherosclerosis and supporting lifestyles are found to generally begin in childhood and propagate further into adulthood.,, Therefore, to effectively bring about a prevention regimen into action, hyperlipidemia is to be identified and addressed at an earlier age. Further research was sought after to reveal more indicators of early lipoprotein dysfunction. It is no longer of surprise that childhood dyslipidemia is alarmingly increased among the overweight and obese populations in comparison to those of normal weight population. Studies such as that by Korsten-Reck et al. had managed to elucidate with evidence that abnormal lipid profiles were seen in as much as 45.8% of overweight children. Dyslipidemia encompasses several disorders that show disturbed lipoprotein metabolism; increased levels in LDL-C, TGs, and total cholesterol; and decreased levels of HDL-C. A case–control study carried out in Turkey was investigating the credibility of BMI in predicting lipid profile abnormalities. Results of the aforementioned study of 100 children, 50 of which had a BMI above the 95th percentile for their age and gender compared to the other 50 children of normal BMI, revealed an increase in LDL-C levels among the obese groups. Our study explains this finding by the positive association established between Log10 BMI kg/m2 and increase in LDL-C (P = 0.038). However, they report no difference of HDL-C levels seen between groups of high BMI and those of lower BMI. We, on the other hand, found an inversely proportional relationship between the mentioned variables. We report a negative association between the Log10 BMI kg/m2 and increases in HDL-C levels (P = 0.007). In addition, the HDL mean among those who disliked fast food was 1.5 ± 0.32, while the mean among those who favored it was 1.3 ± 0.3 (P = 0.001). Interestingly enough, no significant variation of both the mean of LDL-C (P = 0.134) and the mean of HDL-C (P = 0.250) was found among BMI categories, despite a noted increase of LDL-C seen in children with higher BMI values [Figure 1] and an increase in HDL-C in children with lower BMI values [Figure 2]. Contrarily, the log of BMI and cholesterol did manifest a significant variation among different BMI groups [Table 2], which is reinforced by the positive association that was found between weight SD scores and increased cholesterol. The WHO recognizes childhood obesity as a significant challenge of the 21st century as the number of overweight children under the age of 5 is projected to be more than 42 million. Efforts had been directed toward identifying risk factors contributing to the spread of obesity in an attempt to combat the epidemic and promote awareness. Family history, unhealthy diets, low physical activity, sedentary lifestyles, urban residence, and higher socioeconomic statuses have all been found in association with obesity. In our study, no association between opposite genders and changes in lipid profile was proven (P = 0.898), concluding that a greater likelihood among one gender to develop obesity than the other is quite unlikely. High BMI is associated with increased levels of LDL and cholesterol and decreased levels of HDL. Neither association with TG levels nor gender was established. Thereby, we urge health-care providers and medical personnel, especially pediatricians who often interact with legal guardians and caretakers, to educate parents and family members on the substantial threats looming over childhood obesity, further encouraging their children to follow a healthier lifestyle and taking initiative by providing the necessary environment. This is essential even more so in Saudi Arabia, where conventional customs, habits, and regulations promote sedentary routines and precipitating diets. The authors certify that they have obtained all appropriate patient consent forms. In the form, the patients have given their consent for their images and other clinical information to be reported in the journal. The patients understand that their names and initials will not be published and due efforts will be made to conceal identity, but anonymity cannot be guaranteed. 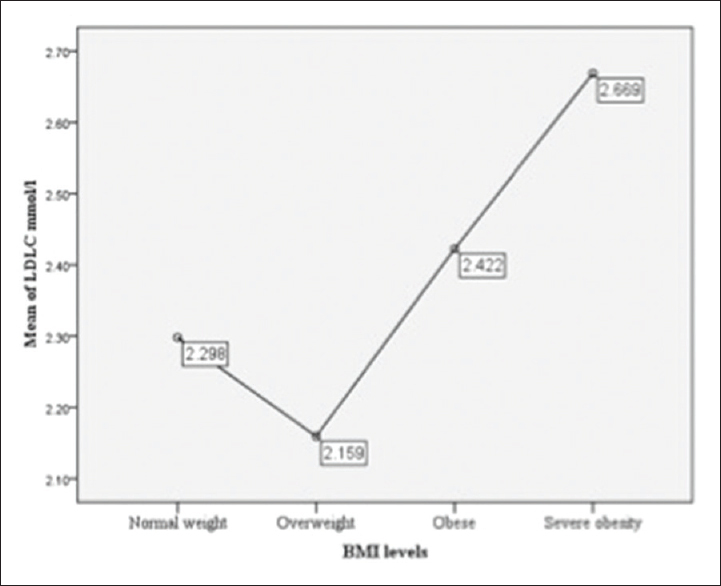 Al Shehri A, Al Alwan I, Al Fattani A. Obesity among Saudi children. Saudi J Obes 2013;1:3. El Mouzan MI, Foster PJ, Al Herbish AS, Al Salloum AA, Al Omer AA, Qurachi MM, et al. 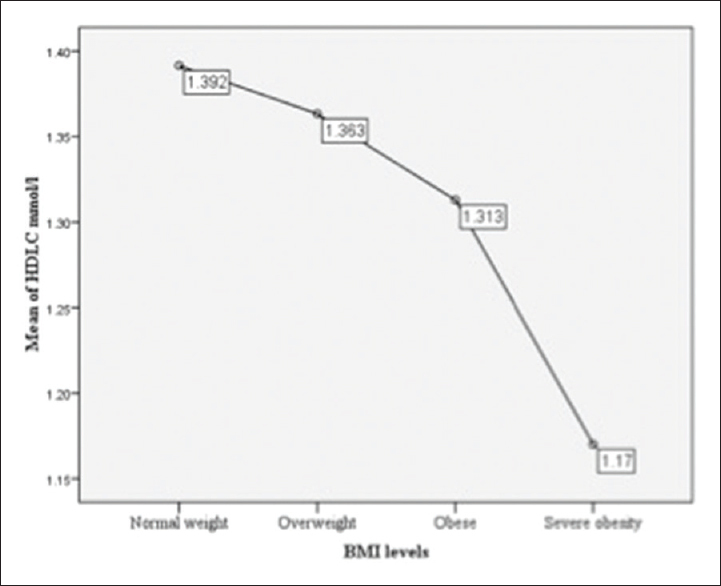 Prevalence of overweight and obesity in Saudi children and adolescents. Ann Saudi Med 2010;30:203-8.
WHO 2008- 2013 action plan for the global strategy for the prevention and control of noncommunicable diseases. Available from: http://www.who.int/nmh/publications/ncd_action_plan_en.pdf. Soler JT, Folsom AR, Kushi LH, Prineas RJ, Seal US. Association of body fat distribution with plasma lipids, lipoproteins, apolipoproteins AI and B in postmenopausal women. J Clin Epidemiol 1988;41:1075-81. Haarbo J, Hassager C, Riis BJ, Christiansen C. Relation of body fat distribution to serum lipids and lipoproteins in elderly women. Atherosclerosis 1989;80:57-62. DiPietro L, Katz LD, Nadel ER. Excess abdominal adiposity remains correlated with altered lipid concentrations in healthy older women. Int J Obes Relat Metab Disord 1999;23:432-6. Pituelli Suárez N, Corbera Prin M, Lioi Luciani S, Turco Pilottó M, D'Arrigo Dri M, Rosillo Politti I, et al. Prevalence of risk factors: Obesity and lipid profile. An Pediatr (Barc) 2008;68:257-63. American Academy of Pediatrics. Committee on Nutrition. American academy of pediatrics. Committee on nutrition. Cholesterol in childhood. Pediatrics 1998;101:141-7. Nascimento H, Costa E, Rocha-Pereira P, Rego C, Mansilha HF, Quintanilha A, et al. Cardiovascular risk factors in Portuguese obese children and adolescents: Impact of small reductions in body mass index imposed by lifestyle modifications. Open Biochem J 2012;6:43-50. Pinhas-Hamiel O, Lerner-Geva L, Copperman NM, Jacobson MS. Lipid and insulin levels in obese children: Changes with age and puberty. Obesity (Silver Spring) 2007;15:2825-31. Meral G, Uslu A, Yozgatli AÜ, Akçay F. Association of body mass index and lipid profiles in children. Open J Pediatr 2015;5:141-6. Steinberger J, Daniels SR, Eckel RH, Hayman L, Lustig RH, McCrindle B, et al. Progress and challenges in metabolic syndrome in children and adolescents: A scientific statement from the American Heart Association Atherosclerosis, hypertension, and obesity in the young committee of the council on cardiovascular disease in the young; council on cardiovascular nursing; and council on nutrition, physical activity, and metabolism. Circulation 2009;119:628-47. Canas JA, Sweeten S, Balagopal PB. Biomarkers for cardiovascular risk in children. Curr Opin Cardiol 2013;28:103-14. Plourde G. Impact of obesity on glucose and lipid profiles in adolescents at different age groups in relation to adulthood. BMC Fam Pract 2002;3:18. Freedman DS, Dietz WH, Srinivasan SR, Berenson GS. The relation of overweight to cardiovascular risk factors among children and adolescents: The Bogalusa heart study. Pediatrics 1999;103:1175-82. Manios Y, Dimitriou M, Moschonis G, Kocaoglu B, Sur H, Keskin Y, et al. Cardiovascular disease risk factors among children of different socioeconomic status in Istanbul, Turkey: Directions for public health and nutrition policy. Lipids Health Dis 2004;3:11. Guo SS, Huang C, Maynard LM, Demerath E, Towne B, Chumlea WC, et al. Body mass index during childhood, adolescence and young adulthood in relation to adult overweight and adiposity: The Fels longitudinal study. Int J Obes Relat Metab Disord 2000;24:1628-35. D'Adamo E, Guardamagna O, Chiarelli F, Bartuli A, Liccardo D, Ferrari F, et al. Atherogenic dyslipidemia and cardiovascular risk factors in obese children. Int J Endocrinol 2015;2015:912047. Korsten-Reck U, Kromeyer-Hauschild K, Korsten K, Baumstark MW, Dickhuth HH, Berg A, et al. Frequency of secondary dyslipidemia in obese children. Vasc Health Risk Manag 2008;4:1089-94. Al Dhaifallah A, Mwanri L, Aljoudi A. Childhood obesity in Saudi Arabia: Opportunities and challenges. Saudi J Obes 2015;3:1-7.